True's Gifts from the Heart. 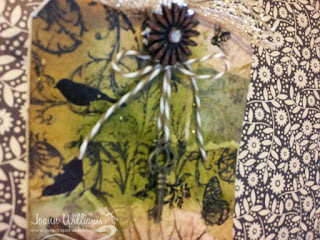 I started off with just a plain manilla craft tag by Ranger. 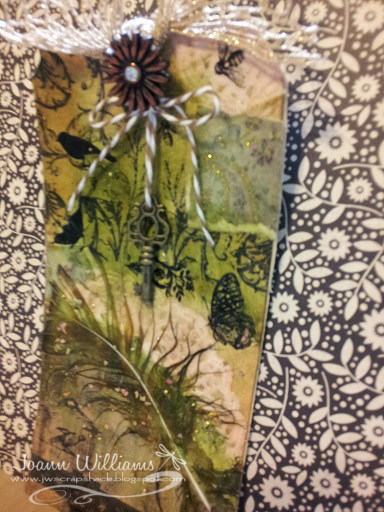 I pulled out my Adirondack Alcohol Inks to create my base background on the tag. I used Latte, Butterscotch, Meadow, Slate and Gold Mixative with some blending solution. 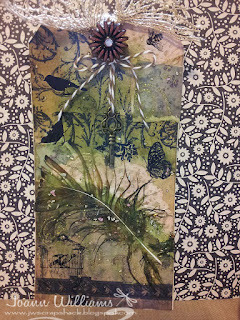 I then ripped up several pieces of a doily and some papers from the Enchanted Paisley line from DCWV. I used some Mod podge to coat and let it dry. Once it was dry, I stamped a flourish background stamp by Anna Giffin using my Ranger archivial black ink. 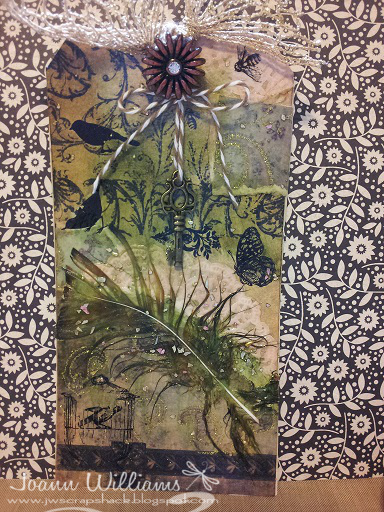 I then added a few rub-ons from 7Gypsies from their "Victoriana" Steampunk line and a feather that I used the same alochol inks on, to make it match the tag background. I then coated it up again with more Mod podge and let it dry. To finish off the tag, I added some burlap ribbon and twine with a key charm by Graphic45 and a decorative button by Bo Bunny. Well thats it for today. Thank you for stopping by! cool looking tag! You got a lot of techniques going on here! Nice job! Great tag, I love all the layering and the finished results is amazing. TFS! This is absolutely GORGEOUS,STUNNING! Love it! Wow Jo, this tag is amazing! You attention to detail is awesome, I don't think I could ever make a tag like this! Who would have know it started life as a plain ordinary tag?!! Love, love it!! Great job my friend! !